The passing of US Senator John McCain has brought forth a wave of lavish eulogies. Some of this is justified. McCain’s experiences as a prisoner of war were extreme and demonstrate his patriotism. No one questions that. But the political focus will turn on his policy efforts, where his career was decidedly more mixed than the portraits now making the cable news rounds. McCain was a fairly typical Republican on many issues – taxes, the use of force, trade deals – rather than the ‘maverick’ image he so assiduously cultivated, and which the press loved to play up. His conservative voting record is not necessarily wrong, of course; that depends on one’s politics. But McCain reveled in the imagery that he was above party, and much of this week’s coverage will emphasize that – as a subtextual shot at current President Donald Trump. But that is not really correct. Recall that on the most important decision of his political career – who would be qualified to be president of the United States? – he chose Sarah Palin, as his vice-presidential candidate in 2008. That is, he gave into the worst elements of the American right. Palin was the pre-Trump – grossly incompetent, trafficking in racially and culturally explosive tropes, sharply partisan. McCain never quite admitted this mistake, nor that he helped open the door for Trumpism by bringing the creepier elements of the US right – like InfoWars and the alt-right – closer to mainstream respectability through Palin. It is true that McCain nobly rejected a question about Obama as an ‘Arab’ in that campaign, but then it is unlikely that question would have come up had he chosen a different vice-presidential candidate. More importantly for Lowy readers, McCain also lost himself in, well, militarism. As others have pointed out, McCain became almost a caricature of belligerent, militaristic neoconservatism. By the end of his career, he was practically robotic in his desire to use force in response to almost every crisis in the world which touched US interests. I cannot think of one time where McCain forcefully argued for trade, aid, diplomacy, regional multilateralism, UN peacekeepers, and so on in response to problems in the periphery of US hegemony. Force was so consistently his answer that one quickly realized that McCain did not actually know much about these places of intervention. Instead, it was American credibility, hegemony, prestige, and so on which were his real motivators. For reasons never quite clear to me, this America-centric, knee-jerk hawkishness was understood in the media as ‘serious,’ ‘clear-eyed,’ ‘tough,’ and so on. 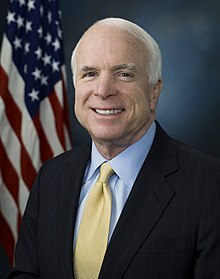 Again and again McCain would go on the Sunday US political talk shows and insist on American arms or assistance in places like Iraq, Iran, Afghanistan, Syria, Libya, Yemen, Georgia, Ukraine… It looked like ‘forever war,’ and by end of the Obama administration everyone was exhausted with this approach. One wonders if he would have counseled a red-line in the South China Sea, risking a major US war with China. That sort of recklessness might have broken his reputation as a foreign policy authority. That this sort of relentless, semi-imperial over-extension helped generate the Trumpian backlash to standard Republican foreign policy never seemed to connect with him. When Trump ran in the GOP primary and said the Iraq War was a mistake, it was like a lightning bolt. Regular, downscale GOP voters – the bulk of the party now – never really knew why the US was in all these places. Trump tapped that, and the other candidates were at a loss. That Trump has not actually governed as a retrencher is another question. But Trump did successfully pose as the candidate who would end America’s growing list of stalemated conflicts. As with the Palin choice, McCain could never quite admit that the Iraq war, which he vocally supported, was an error. Given that Trump disliked McCain and sought initially to downplay his passing, the subtext of all the coverage is the contrast between the two. McCain, for all his flaws, was a demonstrably more serious, more civil, and more committed politician than Trump will ever be. This week’s media coverage of McCain lying in state and the funeral will challenge Trump. Will he be able to control himself? When George W. Bush and Barack Obama speak publicly about McCain, will Trump lash out at two more politicians he loathes? When much of the coverage emphasizes McCain’s patriotism, opposition to torture, anxiety over the growing racism of the GOP, internationalism, and civility toward political opponents, will Trump counter-punch? Trump will certainly want to. Thin-skinned and petulant, he openly resents major political figures who defy him. And Trump is media-savvy enough to know that the Bush and Obama speeches will be filled with subtle digs at him, as will be the press coverage. The GOP base adores him, so he may figure, as he has so often, that he has nothing to lose by indulging his cheap shorts. I imagine he will explode on Twitter at some point. And therein lies the root of the current hagiographic swooning. McCain represents an earlier GOP which, for all its faults, was at least tethered to reality, not openly racist and sexist, not blatantly corrupt, not frighteningly conspiratorial, and at least nominally committed to standards in public life. McCain was the avatar of the pre-Trump GOP which we know and now really, really miss. That a racist reality TV star with no grasp of policy, less competent than Palin, and neck-deep in corruption and self-dealing is president of the United States is still an enormous shock. When I was at the Shangri-La Dialogue this spring and Secretary of Defense James Mattis gave a McCain-style, pre-Trump speech about the rules-based order, America’s commitment to Asia, US belief in democracy and rule of law, and so on, the applause lasted five minutes. Here was the America Asian elites knew and read about. McCain’s lying in state and interment will be similar – here is the ‘normal America’ the world, and a lot of Americans, miss: McCain, Bush, Obama – with Trump not invited. And all of that harkening Americans to repudiate the current wrecking-ball-in-chief. If that is a reason to over-eulogize McCain…well, that’s not so bad. This entry was posted in Domestic Politics, Foreign Policy, Neocon, United States by Robert E Kelly. Bookmark the permalink. I wonder why Kelly fails to mention the ‘patriotic ‘ McCain’s propaganda broadcasts for China while a prisoner during the Vietnam war. He was known derisively by fellow prisoners as ‘the songbird’.